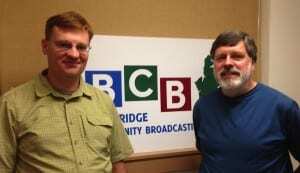 In this podcast, we learn about an upcoming September 17th evening meeting at City Hall. The purpose is to discuss plans for a cycling and walking trail along Route 305 north of Winslow Way, and a potential east-west connection across Route 305 by footbridge or tunnel. In this interview with the City’s Engineering Manager Chris Hammer — and with the citizen volunteer Chair of the Sound to Olympics Trail Committee, Don Willott — the goals of the new grant-funded project are explained. For years, citizen volunteers on the Non-Motorized Transportation Advisory Committee, like Don, have worked with the City to develop proposals and grant applications. In this case, a design and construction grant has been federally funded, and the options for the trail design will be explained at the September 17th public meeting. As Don Willott says, some people think that non-motorized transportation projects are solely about cycling routes. City Engineering Manager Chris Hammer (left) and citizen Chair of Sound to Olympics Trail Committee, Don Willott, discuss in this podcast the Sept 17 7pm City Hall meeting. 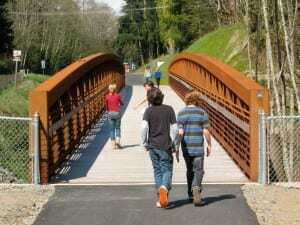 In fact, the safety of walking routes is also part of this project. An important part of the strategy is to construct portions of the trail in a separate area parallel to the road — and a crossing under or over the highway — thereby creating a safer off-road walking or cycling experience for adults and children. One long-term goal is to build a south-to-north route that connects Pugel Sound (at the ferry terminal) with the the Olympics. This early phase of that project covers the stretch from Winslow Way to High School Road, past the Vineyard Lane residential community. Another long-term goal — identified 10 years ago in a transportation study of Winslow — is to provide an east-west connection across Route 305 for pedestrians and cyclists. That connection could take the form of a tunnel on the north side of the Winslow ravine just south of the Vineyard Lane community. Another alternative would be an elevated foot and cycle bridge over the highway in the vicinity of Winslow’s Knechtel Way. 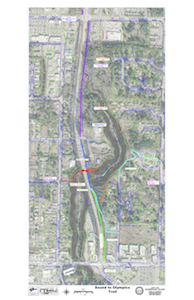 Click on this image to see neighborhoods east and west of 305 that would benefit from a connecting bridge or tunnel across 305. At the meeting, attendees will have a chance to hear from the design teams that have been developing alternative designs for the south-to-north and the east-west elements. 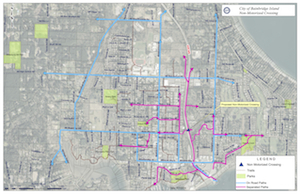 This project is made possible by a federal grant under the Transportation Alternatives Program that addresses alternatives to conventional transportation projects for vehicle traffic. The funding is for both design and construction of a segment of the south-to-north trail from Winslow Way to Vineyard Lane. The public meeting is at City Hall at 7pm on Wednesday September 17th. 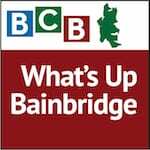 Credits: BCB host and editor: Barry Peters; BCB intro music: Tim Bird; BCB ferry music: Dogfish Bay Studios; BCB podcast art: artopia creative.